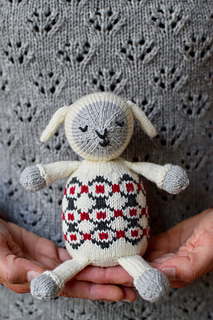 5 exclusive video tutorial links that are specific for the Baa pattern have been added to the pattern on the last page. These videos are not public and are only for pattern purchasers. We hope the videos help you successfully complete your project! 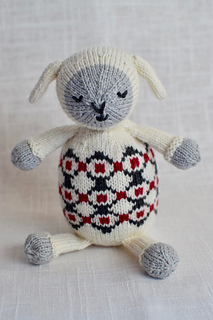 There can never be too many knitted sheep in my opinion and Baa is a super cute one to add to your collection. 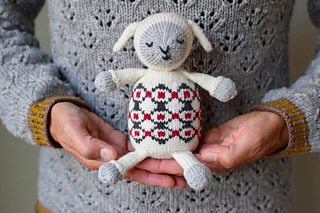 Baa is a nearly seamless knit sheep starting at the bottom of the body and working up. 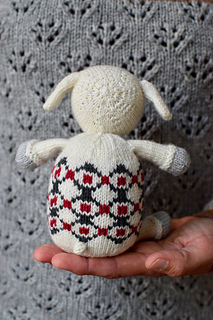 For the body you can add in the charted colorwork section or just knit in one color or maybe you may want to add stripes. 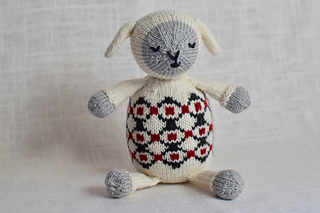 After the body is completed the head is knit separately and attached to the body. 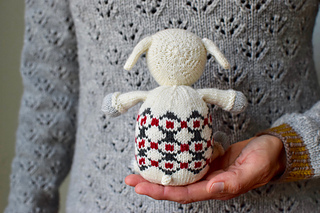 The ears, arms, legs and tiny tail are all picked up and knit on so there is no seaming of tiny parts. Barrett Wool Co. Home Fingerging Weight (100% American Wool; 100 grams and 370 yds or 338 m), 1 skein for the Main Color and small amounts of three contrasting colors. Sample is made with Picket Fence for the Main Color and Peppercorn, Ellie Gray and Red Flannel for the contrasting colors.